A rare victory in Thurles and perhaps a statement of sorts from the Dublin hurlers. They beat Tipperary by a point in a match the home team never led to book a league semi-final with All-Ireland champions Limerick next weekend. Progress had been steady for Dublin under Mattie Kenny thus far but yesterday's victory was significant in a number of ways. Dublin arrived on the back of a quietly impressive Division 1B campaign but against the backdrop of a horrific recent record against Tipp, particularly in Semple Stadium. Their two most recent visits ended in 22- and 14-point defeats, while the ground had staged grim finales to the reigns of Ger Cunningham and Anthony Daly. This time, though, they had a goal within four minutes. One of the few balls Eamonn Dillon won off Cathal Barrett in that half spilled kindly towards Oisín O'Rorke. His shot under pressure was scuffed but Dillon and Feargal Whitely were loitering close enough to ensure the ball was flicked to the net, with Dillon appearing to get the final touch. Mostly, Dublin used a strong wind well in the half. Seán Moran (two), Chris Crummey and Eoghan O'Donnell scored points from 80 metres or more out. Tipp, meanwhile, couldn't quite calibrate their shooting. The accuracy and sharpness so prominent in their play in Páirc Uí Chaoimh was curiously absent here. Collectively, they hit nine first-half wides, few of which could be blamed on the breeze. The Dubs' four-point half-time lead might have been a surprise but it wasn't unheralded. They led Tipp by eight points in Croke Park last year at the same stage of this competition but lost by 11. Kenny had words with referee Patrick Murphy as the teams retreated for half-time and though the source of the Dublin manager's ire wasn't clear, the free count - 12-3 in Tipp's favour - probably had something to do with it. The lead was wiped within five minutes of the restart, with Jason Forde (two), Jake Morris and Noel McGrath bringing Tipp level. Indeed, they restored parity on three occasions in the second half but couldn't quite nose into a lead. And any momentum Tipp generated quickly abated with another wide. They finished with a stack of them - 18 in total - to Dublin's six. Seán Moran, immense all through, stepped up to land a '65' - his fifth point of the match from centre-back - before Paul Ryan, in just his second appearance this spring, put Dublin two up. 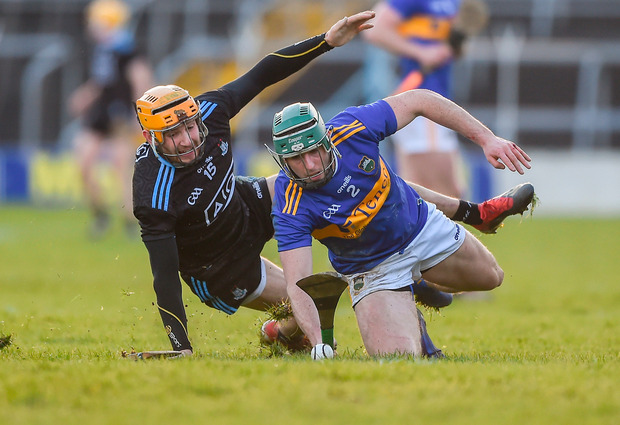 Danny Sutcliffe was sent off for a second yellow card while Brendan Maher made his comeback from a cruciate ligament injury as a second-half substitute but as far as things to cheer about the day go, that was about it for Tipp. Maher nailed a huge free to leave just one point between the teams but after a late Ronan Maher line-ball sailed wide, time ran out and Dublin had their victory. 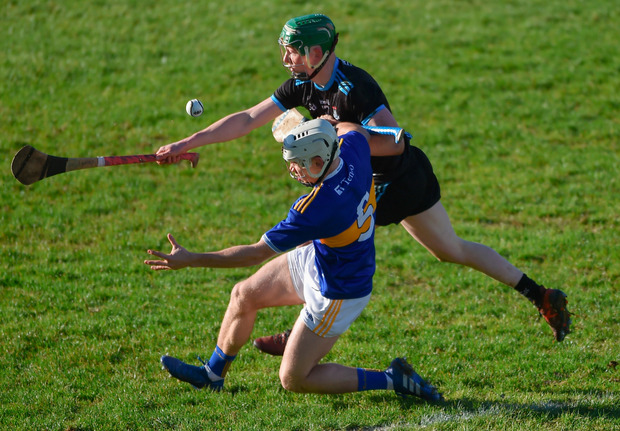 Scorers - Dublin: E Dillon 1-3; S Moran (3f, 1 '65), O O'Rorke (4f) 0-5 each; C Boland, P Ryan 0-2 each; E O'Donnell, C Crummey, J Malone, R McBride 0-1 each. Tipperary: J Forde 0-7 (6f); N McGrath 0-4 (1f); J Morris 0-3; M Kehoe, Callanan 0-2 each; R Maher, M Breen, N O'Meara, J McGrath, B Maher (f) 0-1 each. Dublin: A Nolan; P Smyth, E O'Donnell, D Gray; D O'Connell, S Moran, C Crummey; R McBride, S Treacy; C Conway, D Sutcliffe, J Malone; F Whitely, O O'Rorke, E Dillon. Subs: C Boland for S Treacy (h-t), J Hetherton for Conway (h-t), P Ryan for Whitely (56), R Hayes for Malone (61), D Treacy for O'Rorke (69 inj). Tipperary: P Maher; C Barrett, J Barry, Joe O'Dwyer; R Maher, Pádraic Maher, R Byrne; N McGrath, M Breen; J McGrath, S Callanan, N O'Meara; John O'Dwyer, J Forde, J Morris. Subs: Patrick Maher for J McGrath (35), B Maher for Byrne (47), M Kehoe for John O'Dwyer (57), A Flynn for Breen (61), D Maher for N McGrath (73 inj).